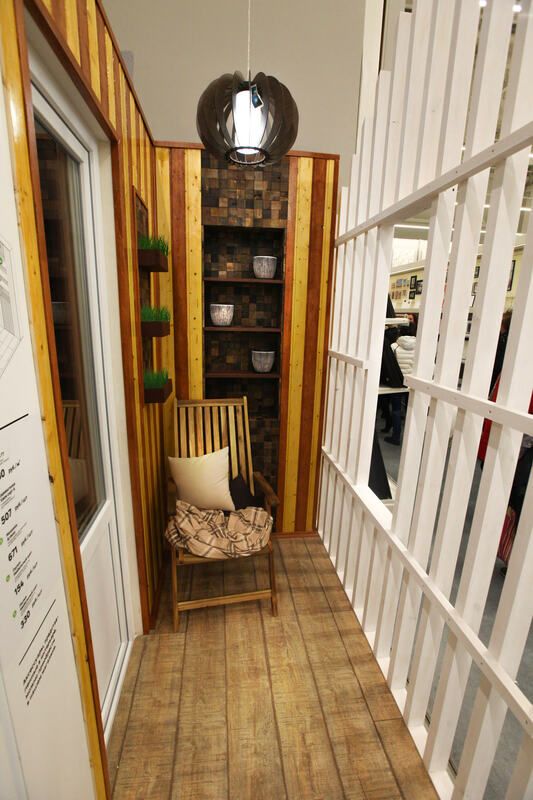 to create inspiration zones in a home renovation store. 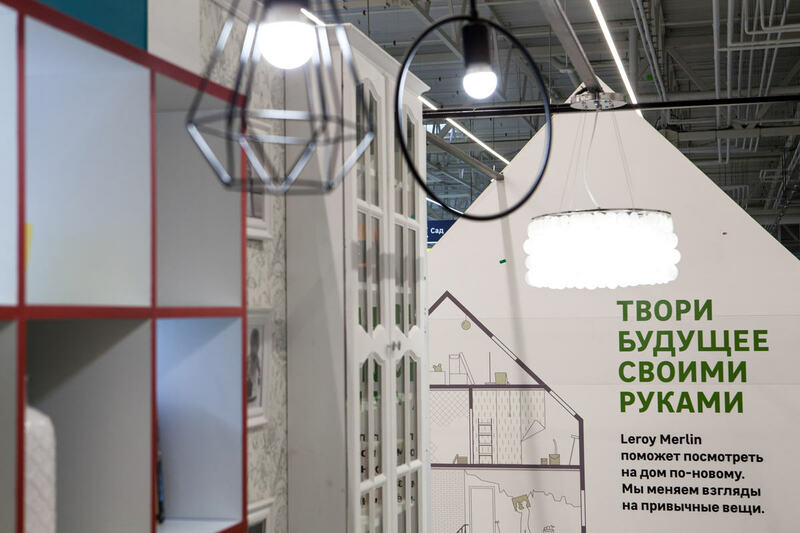 The first Leroy Merlin store opened its doors in Kaliningrad. Its owners wanted the store to become special and stand out among other hypermarkets. 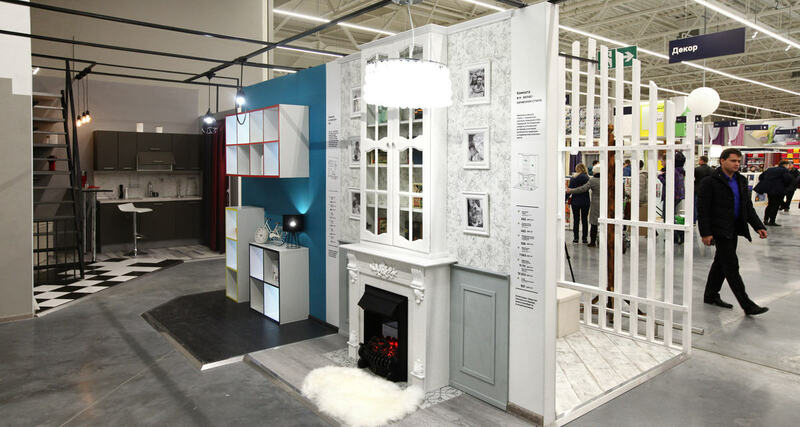 Inspiration zones for the store consisting of several homes with interiors tastefully decorated using the store’s products were created at the studio. 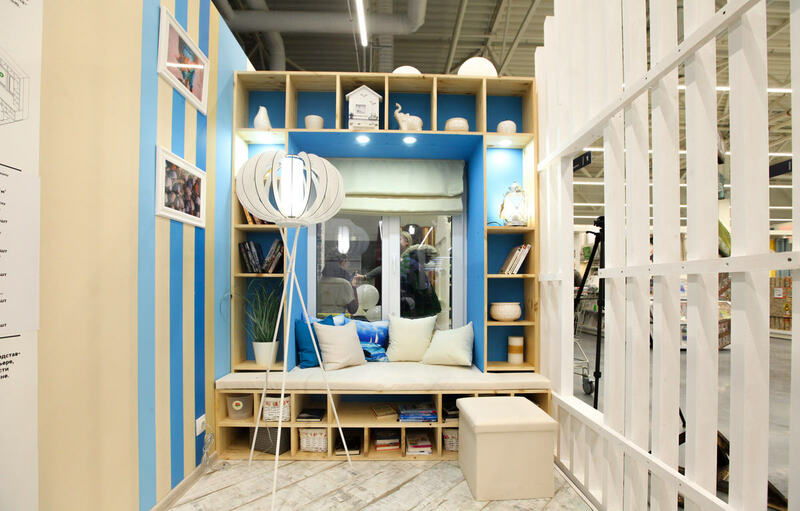 The zone which is seen by all visitors on their way to product shelves contains six mini spaces. Their interiors show how to best use the items sold in the store. 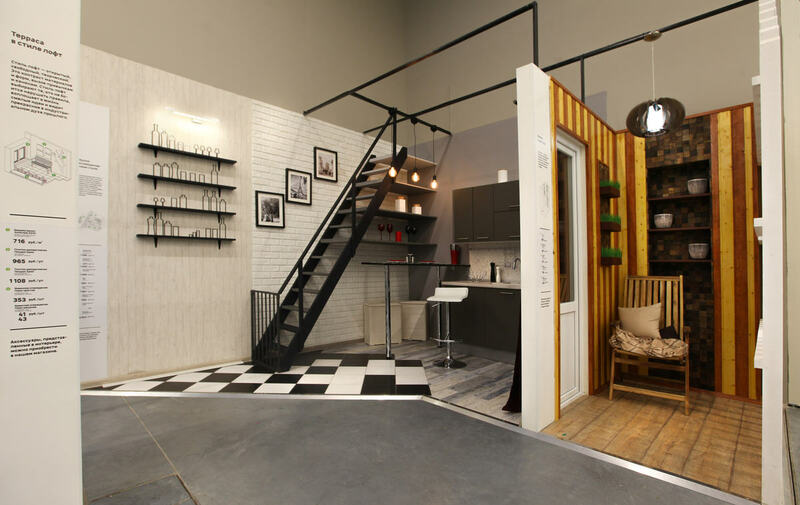 The structure of he houses encourages buyers either to enter them or to explore their layout from the outside. Thanks to he perforated walls, either is equally easy to do. 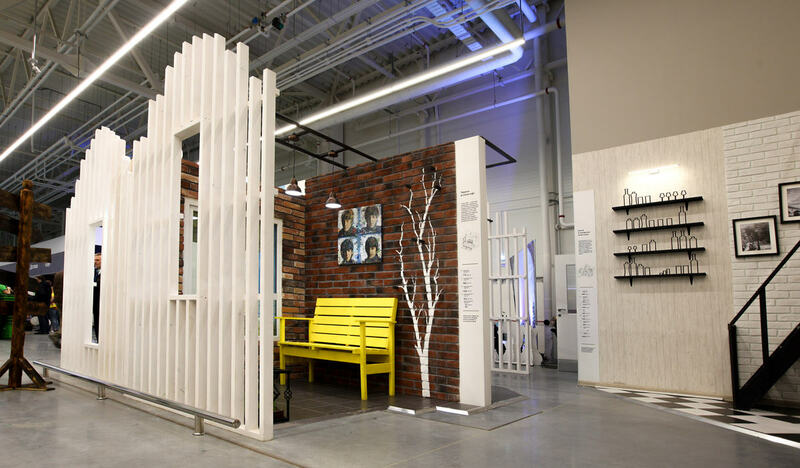 Frames of the houses are made of wallboard and are painted white, helping the structures stand out among colorful packages and shelves of products in the store. 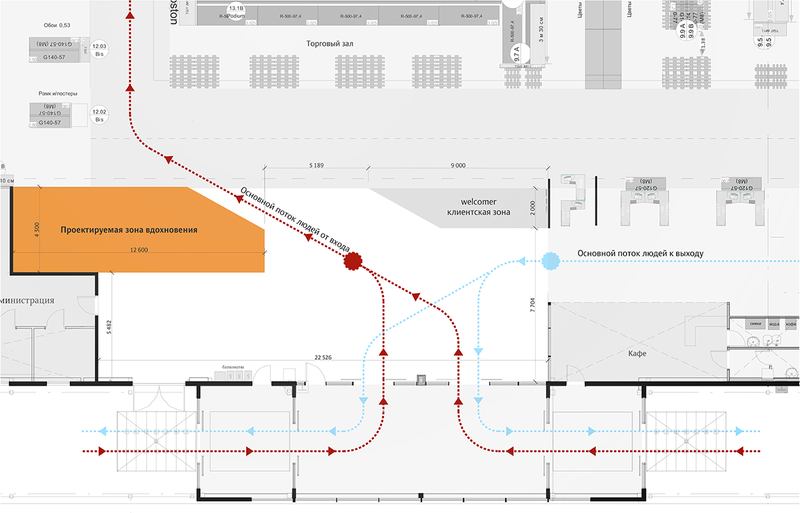 Each of the interiors has its own style and is positioned on the “street” in a special way designed to lead visitors from one space to the next. Wall signs contain brief descriptions of each style. The Mediterranean interior is simple and logical. Preference is given to natural materials and neutral colors. 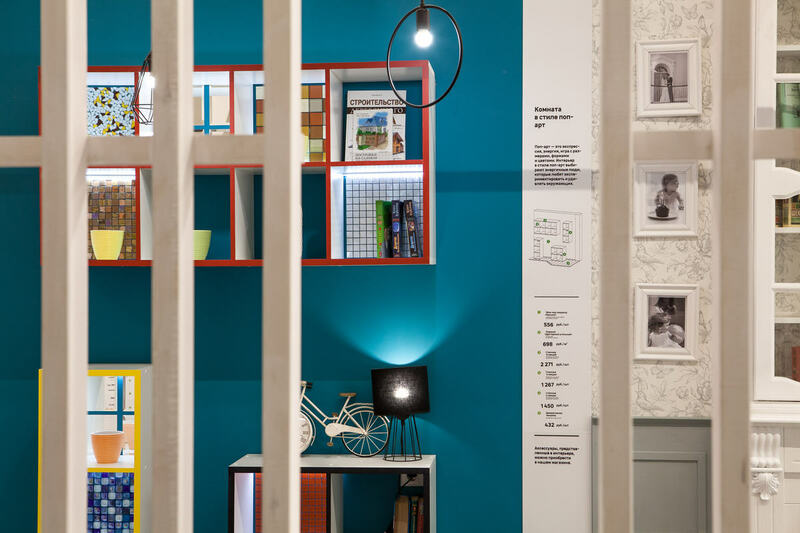 The highlight of the composition, a capacious shelving unit, is built using furniture board. The variety of DIY shelves can be filled with books, souvenirs, gift boxes, plant pots and other things. When needed, the window sill can be transformed into a couch to be used as a place of rest. The interior also includes a large basket weave pouf. The living room designed in the Neoclassical style invites to relax and quietly sit in the chair drinking coffee and listening to the crackling of firewood in the fireplace. Calming colors are combined with natural textures. The traditional materials were used in unusual ways in this interior. 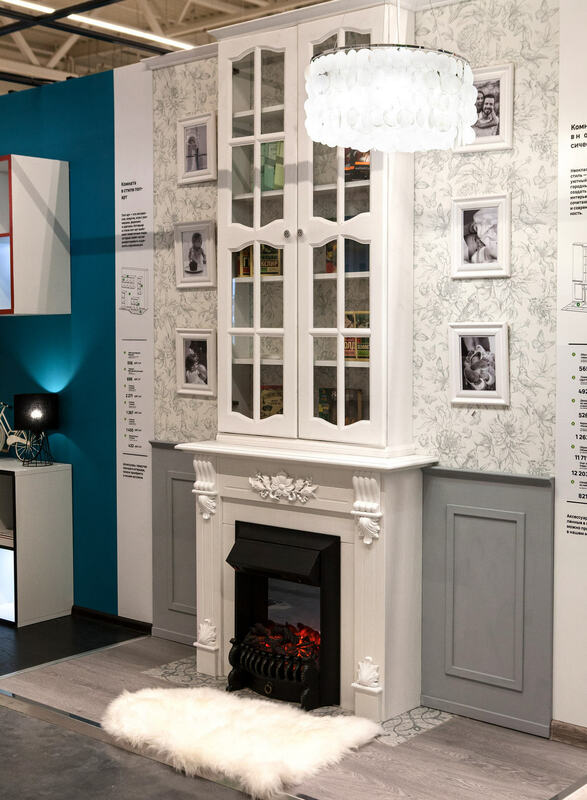 The bottom wall panels are made of wood covered with silver paint, while the shelf above the fireplace is made of furniture board. Elegant white decorative elements complete the interior. When designing the Pop Art interior, we did everything we can to make sure people don’t see it as an odd curiosity. We wanted to show that by combining traditional materials and colors in an unconventional way it’s easy to find a place for a similar room in any apartment. 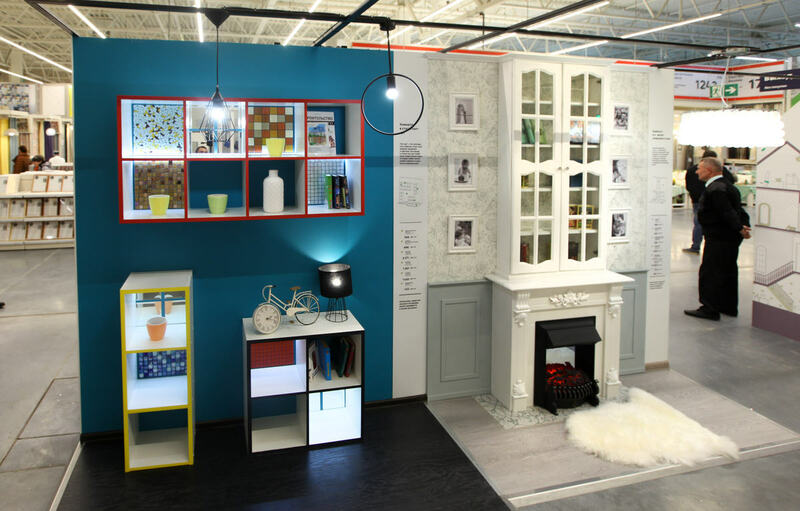 The ends of standard white shelves were painted in bright shades while the rear walls were decorated with mosaic that can be easily changed if needed. A couple of original lamps and accessories finalize the interior. 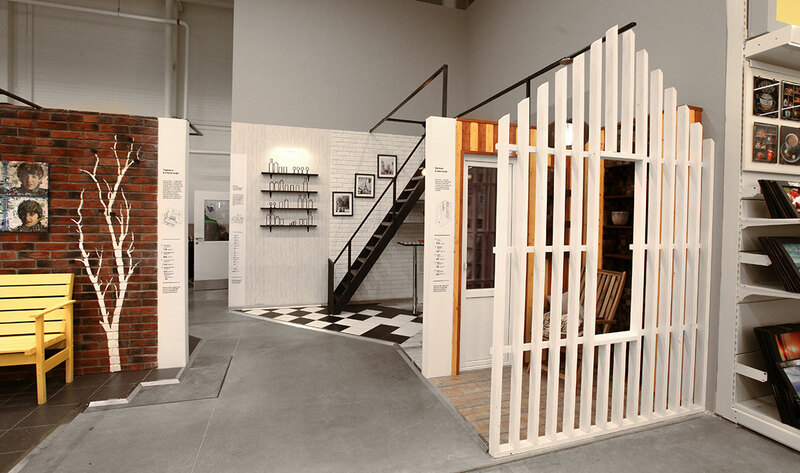 We used stone, wood and ceramics to materialize the neat and functional Scandinavian style. 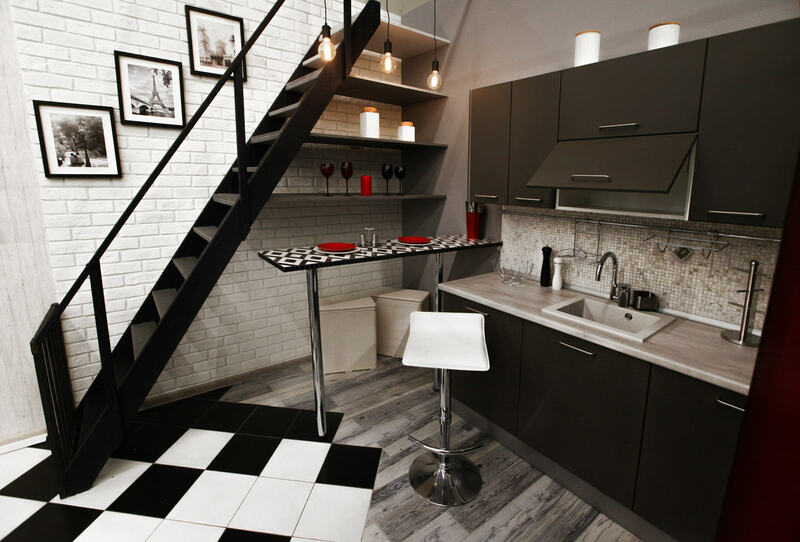 The dominating color pair of black and white is supplemented by cool gray. As a result, the kitchen came out austere and to bring down this austerity we introduced several unusual elements into the interior. 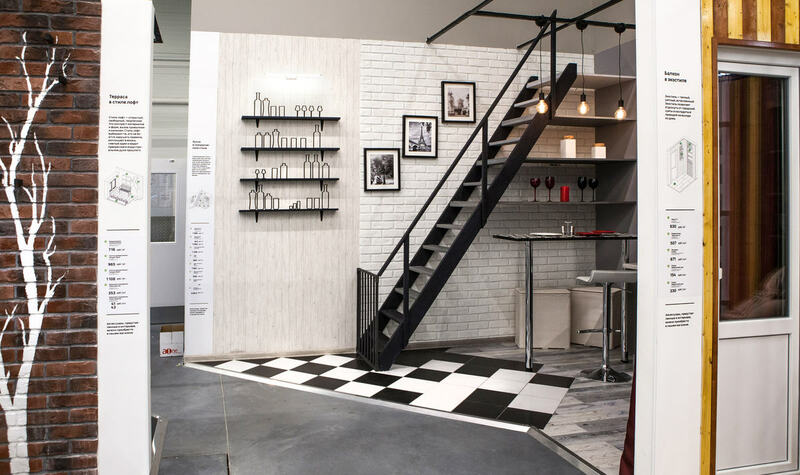 The upper steps of the stairs leading to the second floor become shelves for storing glassware while the surface of the bar counter rhymes with floor tile. 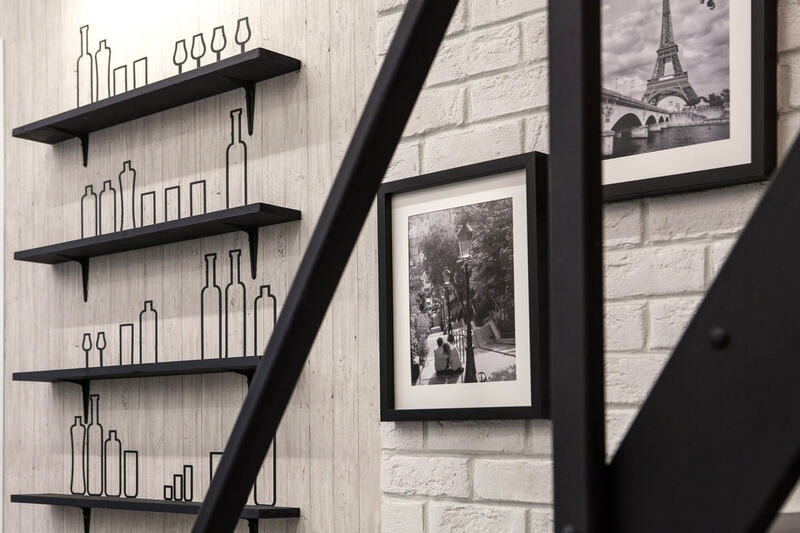 Black wooden shelves are occupied by outline drawings of bottles, glasses and tumblers. Light fixtures and additional decorative elements conclude the look. A door in the kitchen leads to an enclosed balcony that we decided to make warm, cozy and homely. The ergonomic storage system is decorated with mosaic while the walls are covered with wood stained in alternating light and dark shades. Everything is natural, urging to admire its looks and enjoy the tart smell of wood. The style is completed by flooring finished in wood-like porcelain tile and an unusual pendant lamp. The loft-style garden makes use of rough brick walls with an outline of a tree with fallen leaves painted with oil paint. The lemon-colored bench and a fragment of a juicy lawn bring life to the interior. The deliberate simplicity of the loft provides a great backdrop to the portrait of the Liverpool Four on the wall and copper lamps painted in the steel color typical of the style. 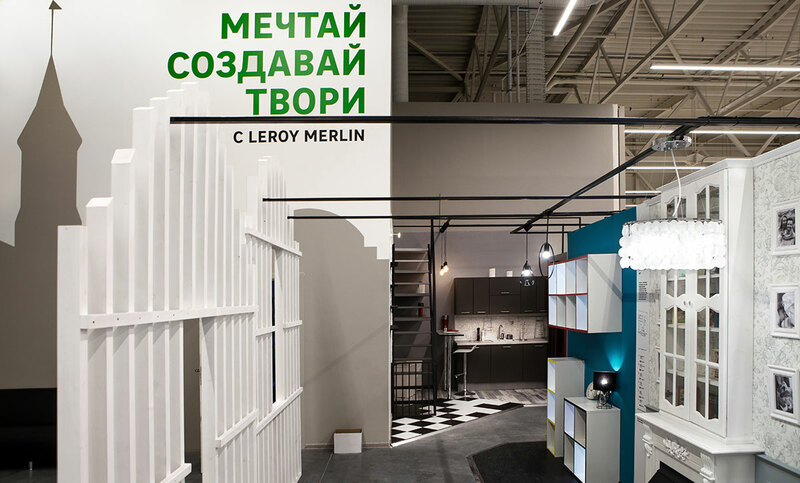 The interiors created at the studio demonstrate that products offered by Leroy Merlin can be used to easily customize any space in any style. Welcome signs and information panels were created for each zone to improve navigation for visitors. 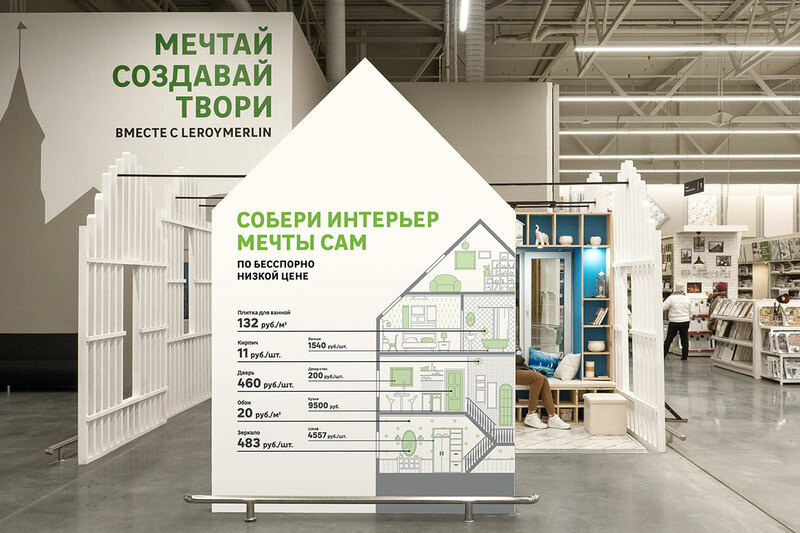 The signs show the layout of the house and contain information on minimum prices of materials offered in the store.